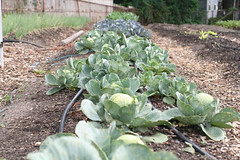 cabbages This has been a great week on the farm. With our spading machine back in business after a couple weeks in the shop and a string of beautiful sunny days, we have been able to finish preparing the final beds of the season for planting. With a little help from the weather, we will plant our last seedlings from the greenhouse into these beds this week. This marks an important transition in the farm season: all the months of crop planning and planting have come to an end, and now we harvest and hope for a long, warm fall….. The story of cabbage, while not an obvious conversation starter, is something I love to share whenever the opportunity arises. When I first started farming, I remember noticing in seed catalogs that all of the members of the cabbage family had the same Latin name (Brassica oleracea). This included broccoli, cabbage, kale, collard greens, cauliflower, and brussels sprouts, to name a few. This piqued my curiosity, and when I looked into it what I found out fascinates me to this day. The story of all these crops begins on the shores of the Mediterranean Sea more than 5,000 years ago with the humble and scraggly Wild Mustard plant. Somewhere around that time people started to domesticate this edible and nutritious plant. As the domesticated Wild Mustard was adopted by various cultures throughout Europe and Asia Minor, the farmers from these cultures saved seed from the plants that showed characteristics they found particularly desirable. Over time, this kind of passive breeding resulted in different crops recognizable to us today. For some cultures, these qualities included the prolific production of large leaves (collard greens, kale), for some, tightly packed flower buds (broccoli and cauliflower), and, in the case of cabbage, it was tightly-packed heads which could last for months when properly stored. What I like about this story is that all these dissimilar crops started with one nondescript plant. It took countless generations of farmers growing the seeds they inherited, cultivating and selecting the best of what they had, and then passing along the seeds of these crops to their children to be cultivated again. That this resulted in such an array of shapes and flavors is a testament to the diversity of human tastes and needs. Melt butter in nonstick medium skillet over medium-high heat. Add pecans and stir 1 minute. Add brown sugar, Worcestershire sauce, and cayenne; stir until nuts are coated, about 1 minute. Transfer nuts to foil sheet and cool. Whisk both vinegars and mustard in small bowl. Gradually whisk in oil. Season dressing to taste with salt and pepper. Toss apples with lemon juice in large bowl. Add cabbage, carrots, and dried cherries; mix. Add dressing and toss. Stir in pecans and season salad with salt and pepper. Note: Spiced pecans and dressing can be made 1 day ahead. Store pecans airtight at room temperature. Cover and chill dressing; bring to room temperature and rewhisk before using. Preheat oven to 350F. Using a curved vegetable peeler, coring tool, or small knife, remove core, seeds and membranes from each apple. Do not cut through the bottom of apple. Place apples in a 9-inch pie dish. Fill each apple with brown sugar. Poke a cinnamon stick into each sugar-filled core so that it sticks up at an angle. Pour orange juice over apples until there is about ¼-inch of liquid in the bottom of the pan. Bake until apples are tender throughout but still hold their shape, 30-40 minutes. Place into individual dishes, spoon remaining juice over apples and serve.